The online apologetics and discernment work Apprising Ministries has been covering the rise within mainstream squishy evanjellyfish of the sinfully ecumenical neo-liberal cult of the Emergent Church aka the Emerging Church with its quasi-universalism in a new version of Progressive Christian theology under their spiritual circus “big tent” Emergence Christianity. As I explained in Emergent Church: A Diseased Tree the discernment ministry Herescope has some excellent articles that uncover the real truth about the actual beginnings, through Leadership Network (LN), of the EC—which is a seeker friendly movement for the pouty postmodern set. I was hired [by Leadership Network] to create, what they refered to in internal language there, as the Young Leaders Network…the way I handled the majority of what I did in the Young Leader Network was to travel all over the country, follow up on leads, and meet people, and ask them if they would want to join together with others in these kind of conversations… I almost think that Ken Silva would have no one to write about if we hadn’t created this little network. In the late 1990’s, I was invited to become part of Leadership Network’s Young Leader Networks (YLN), also briefly known as the TerraNova Project. I was grandfathered in as the network’s “old guy,”…I met with Doug Pagitt to discuss our future plans, YLN having just been launched by Leadership Network to continue on its own as an independent entity. Let me just cut to the chase on this one: [Doug] Pagitt is a Universalist. What he was saying is real simple. He was saying when you die your spirit goes to God and judgment means that whatever was not right about you, whatever was bad about you, whatever was substantially lacking about you, gets all resolved. It doesn’t matter whether you’re a Buddhist, a Hindu or a Muslim—doesn’t matter whether you’re a Christian really; we’re all going to end up in this wonderful, warm and fuzzy relationship with God. That’s just classic universalism. Your unwillingness to allow others to speak to you or answer you and for you to continue to slander while hiding is sin. You need to repent of it and change your ways. For you to not be willing to listen to godly counsel is very concerning and a sign of your hard heart. Come on my show, or allow me to meet you in person and show you your sin. Oddly enough, Doug Pagitt told me about my supposed “unwillingness to allow others to speak to” me, um well, while we were having a dialogue in a combox over at his personal blog; in the real world that is hardly hiding and being unwilling to speak. Unfortuately, Pagitt has no ground to stand on because the documentation is right within my writings concerning the false teachings of Doug Pagitt. 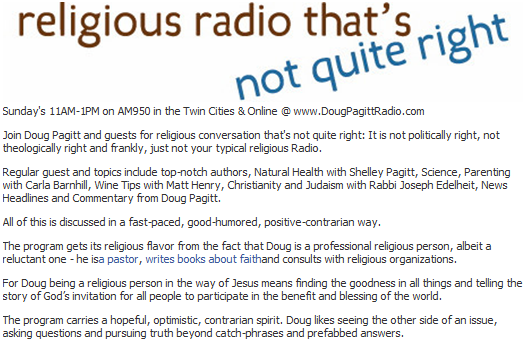 Here’s a couple of quick examples; first, in my post Toxic Theology Of Doug Pagitt I’ve already pointed you to a review of Pagitt’s book A Christianity Worth Believing appropriately entitled A Simple Review of “A Christianity Worth Believing”, which I also cited in Michael Dowd And Doug Pagitt Of The Emerging Church. the Bible is an active and living book that, in his own words, “invites us to step into the stories, not as observers, but as participants in the faith that is alive and well and still being created.” The implication being, the Bible is not a fixed, immutable, infallible Word from above, but rather a piece of God’s ongoing story in humanity; a story that Pagitt, Solomon’s Porch, and other communities of faith, can participate in as they join in the ongoing creative activity of writing their own story for today, just as Paul did for his day. Brian McLaren, A Generous Orthodoxy [Grand Rapids: Zondervan/Emergent YS, 2004], 275. John Bohanon, Preaching & The Emerging Church: An Examination of Four Founding Leaders: Mark Driscoll, Dan Kimball, Brian McLaren, and Doug Pagitt [Seattle: CreateSpace, 2010], 88.